"The Flame and the Arrow", "The Crimson Pirate"and "Trapeze". Sgt. Milton Warden in "From Here to Eternity"
Bill Starbuck of "The Rainmaker"
Wyatt Earp of "The Gunfight at the OK Corral"
Elmer Gentry of "Elmer Gentry"
Dr. Ernst Janning of "Judgement at Nuremberg"
Gen. James Matton Scott of "Seven Days in May"
However, very rarely are the three motion pictures of this article mentioned, or even remembered. The road to being an actor started when 19 year old Burton Stephen "Burt" Lancaster met Nicholas Cuccia (pronounced coo-cha) in New York City. The two young men would become life long friends and together went to the "Union Settlement House's" summer camp at "Palisades Interstate Park". There they learned both acting and acrobatics. At the start of the 1930's the two young men formed an acrobatic act. Burt Lancaster changed his last name to Lang and Nick Cuccia changed his to Cravat. The next thing "Lang and Cravat" did was to make every boys dream at the time come true. They joined the "Kay Brothers Circus". The pair on the horizontal bars during a performance of the "Kay Brothers Circus". The duo next moved to the "New Deal's" "Federal Theatre Project Circus". Appearing between 1935 and 1938. Here is a picture of the two at this time. In 1939 Burt Lancaster injured his hand and ended "Lang and Cravat's" acrobatic act as a result. Returning to his own last name Burt Lancaster he reluctantly became an actor after completely his service in the Army during the Second World War. Lancaster started on the legitimate stage in New York and worked his way onto the convenient Broadway Stage in leading roles . This would lead to meeting his future business partner Harold Hecht. Which in turn lead to a reverting performance opposite Ava Gardner in his first motion picture. The film was made in 1946 and was loosely based upon a Ernest Hemingway short story "The Killers". Burt Lancaster's motion picture career was launched. 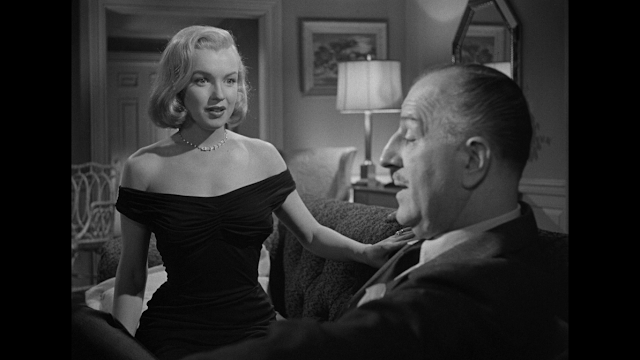 By 1949 Nick Cuccia had legally changed last name to Cravat and entered motion pictures with a non screen credited role in "My Friend Irma", The movie also contained the first on screen performance by the comedy team of Dean Martin and Jerry Lewis. At the request of Burt Lancaster the two friends were reunited on screen in "The Flame and the Arrow". "The Flame and the Arrow" has been described as an Italian version of the 1938 Errol Flynn picture "The Adventures of Robin Hood" and there are similarities in the plot. Also both films were made by Warner Brothers at the same locations in the San Fernando Valley were the Warner Brothers studio was located. In "Robin Hood" you have Prince John. In "Flame and the Arrow" you have Count Ulrich. In "Robin Hood" you have Sir Guy of Gisbourne. In "Flame and the Arrow" you have the Marchese Alesandro de Granazia. In "Robin Hood": you have Maid Marian. In "Flame and the Arrow" you have Anne de Hesse played by Virginia Mayo. In short the characters pretty much have the same traits. Also in both pictures you have "The Merry Men" band of outlaws working with the hero. The basic plot for "The Flame and the Arrow" has Burt Lancaster as Dardo Bartoli the "Arrow". Who with his son encounter Count Ulrich "The Hawk" out hunting. In Ulrich's party is Dardo's unfaithful wife and the Lady Anne the "Flame". At this meeting Dardo demonstrates his archery skills by shooting Ulrich's favorite Hunting Hawk out of the air. In retaliation Ulrich takes Dardo's son hostage and action that is followed by Dardo kidnapping Anne. The stage is now set for Dardo and his men to save his son, but after he starts to fall in love with the Lady Anne. Again their are similar scenes reworked in "The Flame and the Arrow" that seem right out of the 1938 "The Adventures of Robin Hood". One scene has the Lady Anne sending a warning to Dardo as did Maid Marian to Robin, of an attack and trap being set. In "The Adventures of Robin Hood" Robin devices a plan to sneak his men into Nottingham Castle for the climatic battle. In "The Flame and the Arrow" Dardo has a plan to enter Count Ulrich's castle. Which also gives Burt Lancaster and Nick Cravat a chance to show off the acrobatic skills. 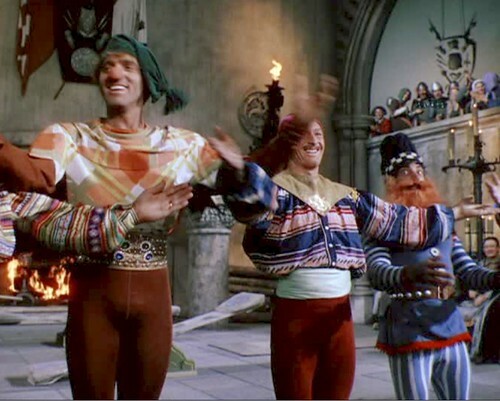 They arrive disguised as of all things acrobats coming to entertain Count Ulrich and his friends. In the still below Burt Lancaster is on the left and Nick Cravat on the far right. The film is good old fashion fun and a chance to watch Lancaster and Cravat at the top of their acrobatic form and well worth the visit. At the time of my writing this article the fifth "Pirates of the Caribbean" film is being prepared with the return of Captain Jack Sparrow. Actor Johnny Depp and producer Jerry Bruckheimer have stated along with many film historians that the "The Crimson Pirate" with "Captain Vallo" is the prototype for the character of Jack Sparrow and Vallo has been referred too as Jack's "Grandfather" . Released September 27, 1952 "The Crimson Pirate" sets it tone before the credits begin. The audience sees Burt Lancaster as Captain Vallo swing through the yardarms and the camera comes upon him in a close-up. Lancaster than breaks the fourth wall of theater and looks directly into the camera to tell us that this is a tale of the last voyage of "The Crimson Pirate" in a Pirate world. We are also told by Vallo to believe everything we see. Lancaster than swings to another part of the sails and readdresses the audience correcting his little speech to believe only half of what we see. The credits then role. At the time Pirate films were the rage and most were serious. This all started with Walt Disney's "Treasure Island" starring Robert Newton in 1950. In 1952, Newton would return as "Blackbeard the Pirate" and two years later recreate his Robert Lewis Stevenson character in "Long John Silver". Then there was "Anne of the Indies", "Fortunes of Captain Blood" a remake of the Errol Flynn picture, "Against All Flags", "Captain Pirate" and my reader gets my point. One of the newer actors in a small, but important role played the Spanish Naval Officer Joseph. This actor recounted the change of tone from the original conception of "The Crimson Pirate" to what would become a Burt Lancaster acrobatic classic. Oh, the actors name was Christopher Lee and this quote is from his autobiography: "Tall, Dark and Gruesome". The next name in the movies credits following Burt Lancaster is Nick Cravat who plays Ojo. Followed by the weakest actor in the picture the actress Eva Bartok as Consuela, Also in the film was the great British character actor Torin Thatcher. My readers my remember his portrayal of the Evil Magician in "The 7th Voyage of Sinbad". In "The Crimson Pirate" Thatcher played Vallo's mate the "Humble Bellows". In another small part was a British actress starting out the future leading lady Dana Wynter. Probably best remembered for 1956's "Invasion of the Body Snatchers", "Sink the Bismark" and "The List of Adrian Messenger". "The Crimson Pirate" opens with Captain Vallo and his crew capturing a King's ship with the villain of the film Baron Jose Gruda on it. Vallo then decides to impersonate Baron Gruda and sell the ships weapon's to "El Libre" a rebel on the island of Cobra. He also plans to trick "El Libre" and capture him to be sold back to the real Gruda. Some of the crew including "Humble Bellows" complain that plan is not real pirate work, but loyally follow Vallo. Of course things don't go as planned when Lancaster and Cravat meet the rebels and Vallo falls for "El Libre's" daughter Consuela. The movie is full of acrobatic moments for Lancaster and Cravat. One has them being chased by Spanish soldiers. The sequence used hidden trampolines and perfectly placed horizontal bars. The films ending includes a scientist using the drawings of DaVinci to make machine guns out of wagon wheels and flintlock rifles, a giant balloon, nitroglycerin and a submarine, However, before all this happens Baron Gruda is forcing Consuela to marry him. The wedding is to held at a special festival which includes the unwed ladies of the island who are looking for husbands. To disguise themselves from the Baron. Vallo and Ojo dress up as women and we have Lancaster and Cravat in drag. Overall I highly recommend "The Crimson Pirate". A motion picture that brought me fond memories when it came out and I was only five years old, Memories reconfirmed when I finally found it on DVD from South Korea at the age of 67. The final motion picture I want to speak to does not have Nick Cravat in it. That's a shame as it goes to both Lancaster and Cravat's roots. However, the two would appear together in "Ten Tall Men", "Run Silent, Run Deep", "The Scalphunters", "Airport", "Valdez is Coming", "Ulzana's Raid", "The Midnight Man", and the 1977 version of H.G. Wells' "The Island of Dr Moreau". On May 30, 1956 the picture "Trapeze" was released starring Burt Lancaster, Tony Curtis and Gina Lollobrigida. 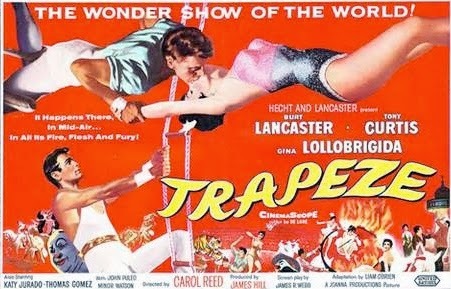 Lancaster plays trapeze artist, Mike Ribble. Ribble only the sixth man to perform a triple somersault in the air. However there is an accident and Mike Ribble is crippled for life. Since then no other flying act has attempted the triple. Into Ribble's life comes young Tino Orsini, Curtis, who tracked him down. Now in France Ribble is basically doing janitor work to be able to stay at a European Circus. Orsini wants Ribble to be his coach and catcher, but mainly to teach him the triple. Everything is going fine until an ambitious women Lola, Lollobrigida, comes between them. After she dumps another circus performer and his act to talk herself into Lancaster and Curtis' trapeze act. The motion picture is from British director Carol Reed.The film was Gina Lollobrigida's first American motion picture. Lancaster performed most of his own stunts except for the triple which was done by Eddie Ward of "Ringling Brothers Circus". I would add that at times "Trapeze" is very slow and prodding, but it again is worth seeing the acrobatic skills of Burt Lancaster and Tony Curtis. Whom he also worked with for the sequences. "The Flame and the Arrow", "The Crimson Pirate" and "Trapeze" that I enjoyed as a young boy. Each illustrates a side of Burt Lancaster seldom seen on the big screen except as a glimpse here and there. As I have mentioned dear reader worth a look. So find these treasures and enjoy. MARCEL DELGADO: The Artist That Built "King Kong"